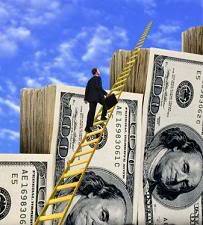 The Financial Ladder: Bigger Online Advertising Budgets = More Money For PF Bloggers? Bigger Online Advertising Budgets = More Money For PF Bloggers? Seeking Alpha reports online advertising spending is expected to be approximately $19.2 billion dollars in 2007. An online market researcher named "eMarketer" expects the financial services sector to increase it's online advertising spending by over 33% to $2.4 billion this year alone, and $3.52 billion by the year 2010. It's now one of the biggest online advertisers online. Could this mean more money for the personal finance, investing and real estate bloggers out there? We do offer a large audience of the type of clientele they're looking for. They are willing to pay big money to the larger personal finance sites out there like yahoo finance, cnn money, aol's market watch, and msn. CNN Money’s display ad rates are $92 - $143 per thousand impressions (cpm)! We may not get as much of the pie as the big shots out there, but it's there for the taking, and I'm a bit hungry..
Nope, not more money for us. Just more PF bloggers earning the same amount! Taxes, Insurance, a Baby, Oh My!